The picture above was taken last Sunday in Indianapolis. 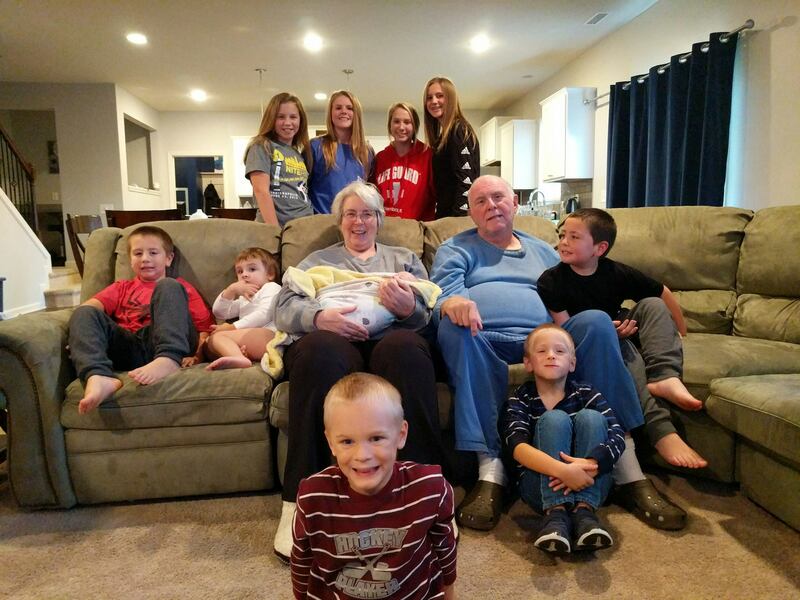 It was the first time all ten of our grandchildren were together. The picture was posted to FaceBook before I had an opportunity to see it. I was asked a couple of days later why I wasn’t smiling. The simple truth is that, moments before, I had been trying to get the boys (aged 2 through 6) to sit still, look at the camera and smile. I was exhausted and remember collapsing on to the couch! It’s great being a grandfather. And Diane loves being a grandmother. Our advice to others in our age group – don’t work until it’s too late to enjoy the grandchildren. You will find the time you spend with them rewarding – and they will remember you until they are old and have their own grandchildren. Retire and enjoy the grandkids! World War One came to an end exactly 100 years ago, on November 11th, 1918. The following article shows that many in Germany want to resurrect the German Empire that collapsed at the end of the Great War. The article is taken from France24, a French television website. Germany’s far right is trying to rehabilitate the German Empire and its role in World War I, resuming a decades-old debate ahead of the centenary of the armistice. The aim is to reevaluate the German Empire (1871-1918) which for decades has been seen in the collective consciousness as the first of the destructive powers of the 20th century. Hamburg University historian Fritz Fischer in the early 1960s confronted the German public with the then controversial thesis that Imperial Germany carried the sole responsibility for the war and the horrors of the Somme, Verdun and Gallipoli. In his work “Griff nach der Weltmacht” (Bid for World Power), Fischer argued that the Germany of William II, dominated by a racist and imperialist elite, had deliberately instigated World War I in a bid to become a world power. Fischer argued that Berlin used the crisis sparked by the assassination of Archduke Franz Ferdinand to go to war with France and Russia to create a German-dominated Europe and Africa — and that this unfulfilled ambition paved the way for the Nazi regime to follow. This overturned the then entrenched national belief that Germany had fought a defensive war. Public interest in the origins of the First World War was revived with the 2013 release of the bestseller “The Sleepwalkers: How Europe went to war in 1914” by Australian historian Christopher Clark of Cambridge University. Rather than just blame Germany and the Austro-Hungarian empire, Clark argues that other European powers shared an imperialist paranoia and, without intending to, sleepwalked into the first industrial-scale war. The success of the book among German readers “betrayed a deep-rooted need to free themselves from blame and guilt,” said the conservative daily Frankfurter Allgemeine Zeitung. The AfD’s Bavaria chapter has promoted Clark’s tome on its website. While Germany has gone to great lengths to remember and atone for World War II, Nazi atrocities and the Holocaust, remembrance of the First World War is far more low-key. Even in this centenary year, commemorations remain minimal. The foreign ministry hosted a conference entitled “Winning peace” in mid-October, but it was not open to the general public. German Chancellor Angela Merkel will only participate in one ceremony, alongside French President Emmanuel Macron, on November 10 in Rethondes, the site of the signing of the Armistice. “German politicians attach great importance to not opening old wounds,” said Leonhard. GERMANY should become a nuclear superpower and spearhead European efforts to acquire weapons, according to leading politicians. Berlin is under pressure to obtain nuclear weapons for the EU over fears the United States will leave NATO. Head of Poland’s ruling party Jaroslaw Kaczynski told German newspaper Frankfurter Allgemeine Zeitung, he would “welcome an EU nuclear superpower” shortly before meeting Angela Merkel in Warsaw. It is thought he may have pressed the German Chancellor on the issue during the visit. * Poland is going through a major battle between Left and Right, with Jewish issues always in the background. Is it condemned to carry this baggage or can it focus on the new threat? * Hungary’s Prime Minister Viktor Orbán aspires to push Angela Merkel aside and become the new leader of Europe. Is this crazy or does he have a chance? “Nigerian Christianity is under siege from radical Islam. The country’s importance to Africa, and to Christianity as a whole, makes this siege particularly noteworthy. With a population of nearly 200 million – about 50% Christian, 40% Muslim and 10% animist (traditional pagan religion) – by 2050 Nigeria will become the third most populous country in the world, the United Nations estimates. No wonder Nigeria has been a strategic target for radical Islamists for several decades. “Boko Haram, a radical Islamic movement whose name roughly translates to “Western education is forbidden,” has ramped up attacks on Christians this year. Since 2009 when Boko Haram began its rampage, about 20,000 Nigerians have been hacked with machetes or shot. Two million have been displaced. Pastors and their families have been specifically targeted for death. “Pastors in northern and central Nigeria face daunting pressures. Some conduct funerals almost every week for victims, often in mass burials. They struggle to answer their parishioners’ questions about God’s love and justice. They hear powerful voices dismiss this as an ethnic clash, but they understand it is a strategic scorched earth war, a jihad against Christianity.” (“Boko Haram put a bounty on my head,” by Hassan John, an Anglican priest and journalist; Wall Street Journal, 10/26). SAN FRANCISCO – Facebook has uncovered a covert Iranian disinformation campaign which attempted to sow political discord in the U.S. over such hot-button issues as race, immigration, police brutality and President Trump ahead of the November midterm elections. “For the past quarter century America’s approach to China has been founded on a belief in convergence. Political and economic integration would not just make China wealthier, they would also make it more liberal, pluralistic and democratic . . .
“Today convergence is dead. America has come to see China as a strategic rival – a malevolent actor and a rule-breaker. The Trump administration accuses it of interfering in America’s culture and politics, of stealing intellectual property and trading unfairly, and of seeking not just leadership in Asia, but also global dominance. It condemns China’s record on human rights at home and an aggressive expansion abroad. This month, Mike Pence, the vice-president, warned that China was engaged in a “whole of government” offensive. His speech sounded ominously like an early bugle-call in a new cold war. “Do not presume that Mr. Pence and his boss, President Donald Trump, are alone. Democrats and Republicans are vying to outdo each other in bashing China. Not since the 1940’s has the mood among American businessfolk, diplomats and the armed forces swung so rapidly behind the idea that the United States faces a new ideological and strategic rival.” (“China v America,” The Economist, 10/20). Two new churches have recently opened their doors in our neighborhood. One is called “Impact” and meets in the Lansing Mall at 10.30am every Sunday. It is hoped that it will save the mall. Like malls everywhere nowadays, it has a lot of empty stores and a declining number of visitors. In keeping with the times (and the needs of the mall), the church is encouraging people to come to church, then stay to shop (from 12 noon on). They can also stay for a movie at the cinema in the mall; or have lunch or a beer at a bar in the facility. The other church is more interesting. It’s a one-theme church, focusing on forgiveness. They have billboards on the way into Lansing encouraging people to be forgiven; and to forgive others. Most Christians are very aware that they need forgiveness. Not so many are able to show forgiveness toward others. Yet, if we can’t show forgiveness, our own eternal life is at stake. The Lord’s Prayer reminds us of the need for us to receive forgiveness and to show it to others. These are sobering words, particularly as we get older. We don’t want to miss out on eternal life because we’ve not shown forgiveness to others!